Find the words in the jumble of letters. You have 10 words on the left side of the screen that you try to find in the mix up of letters. 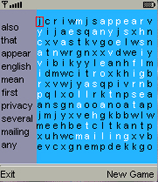 A new wordsearch everytime you play, with different words.